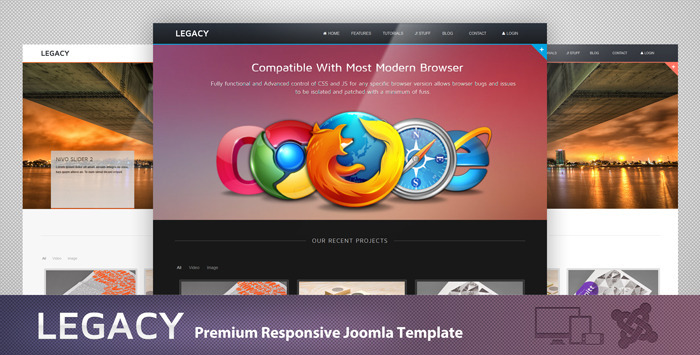 The Legacy theme is modern, multiporpose, super flexible and has a fully responsive design (try resizing your browser) for joomla 2.5 and 3. Built-in LESS CSS compilation and CSS3 base on Gantry Template 4. A lot of thought and care were put into Legacy making it a pleasure to use. Legacy is loaded with options, and has powerful customization options. Legacy can be used for any type of website: business, corporate, portfolio, products, etc. You need to Sign in first in Themeforest. - Add 8 new Presets Style Color. for help in solving the problem. - Add customizable spacing Option for Menu, for height of logo more than 71px. - Add customizable spacing Option for Sequence Slider Title. - Add available Icons Tag for Portfolio.